We all recognise that world is inherently complex but what does this mean? From a theory perspective it means that it is an open system where the agents and the environment coevolve and influence each other. This means that traditional approaches that assume that we can analysis a system and understand what is happening and what we should do no longer hold. We continue to cling to old practices but if we accept that the world is complex how can we make sense of the world? 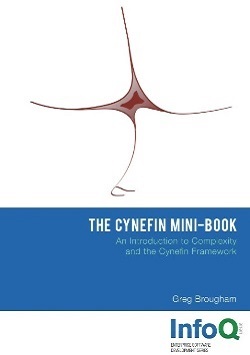 This mini-book started out as a series of papers that were experiential in nature and which were intended to provide an introduction to complexity theory, the Cynefin framework in particular and some of its related practices that allow us to make sense of the world and to know enough to act. The practices that are included are contextualisation, the specification of safe-to-fail experiments and the approach to rigorous review of ideas. These are only a small example of the practices related to Cynefin and there are many more to be explored. Bringing these together into a mini-book also provided the opportunity to add a short section on the use of narrative which supports the contextualisation practices and also to add some thoughts on Cynefin dynamics which deals the management of groups and moving between exploration and exploitation. Greg Brougham is a systems and technical architect specialising in card and payments systems. He has worked on the renewal of the main UK domestic clearing and settlement system and a similar system for one of the major card companies.